Way back in the dark ages (1992) when I first started working as a uniformed police officer, backup guns were separated into two general categories: "reliable" guns and everything else. The "reliable" backups were any snubnose .38 revolver, the Walther PPK/S and the Beretta .22/.25 autos. There were a lot of other types and brands of backup guns carried by officers, but reliability was hit or miss. General concealed carry by the public wasn't really a factor in many states back then, and I believe it is this modern CCW push, combined with modern manufacturing techniques, that has given us this explosion of small pistols. Our choices have never been greater. Inter Ordnance has been in business for more than 15 years, but for most of that time it just imported surplus firearms, mostly AK variants. In the past few years it has invested heavily in manufacturing equipment, and in addition to producing U.S. made AK-pattern rifles and pistols, it is now producing the Hellcat—a 6+1-shot .380—at its Monroe, N.C., facility. A ton of .380s have been introduced in the past few years. What's so different about this one? Actually, the differences are small, but they add up. To be honest, I have yet to find a pocket pistol that I am completely happy with. They are either too small, too expensive, have triggers far too heavy, don't have usable sights, are encumbered with stupid safeties or are just unpleasant to shoot. I like the size, trigger, sights and price of the Hellcat. I.O. makes two versions of the Hellcat, the only difference being the blued or nickeled slide, and the company sent me one of each to test. It is a DAO semiauto with no second-strike capability, and I really liked the trigger pull. It was smooth and not too long. The trigger pull on the nickeled pistol I was sent was slightly lighter than on the blued gun (seven pounds versus eight) but both were more than acceptable for a pocket gun. The gun will fire with the magazine removed. I liked the looks of the blued gun better than nickel one, but if I was going to buy one (and I'm seriously thinking about it), it would be the nickeled gun. Pocket guns take a lot of abuse, and I sweat all over whatever pistol I'm carrying while jogging. Nickel holds up to sweat a lot better than bluing. The slide does not lock back on an empty magazine. Actually, other than the magazine release, the exterior of the pistol is free of controls and shouldn't snag in a pocket at all. The Hellcat has real sights, albeit small ones. Both the notch rear and the post front are machined out of the slide. I thought they might be hard to pick up on the nickeled version of the pistol, but I didn't have a problem. The front sight has a fluorescent green dot that was closer to forest green after I put a couple of boxes of ammo through the gun. To be honest, if you need this gun in a hurry, you're probably just going to be looking over the top of the slide and the sights, but I'm glad they're there anyway. Every gun, even pocket pistols, should have sights. The Hellcat weighs 9.4 ounces empty and comes with one stainless steel magazine with a very much needed finger extension. Yes, that extension means the pistol does not conceal as well, but it allows me to get two fingers on the gun. Between the finger extension and the narrowness of the grip (.82 inch) I could really get a good purchase on the gun. In fact, after shooting a subcompact .40 S&W recently, the Hellcat seemed like a pussycat. 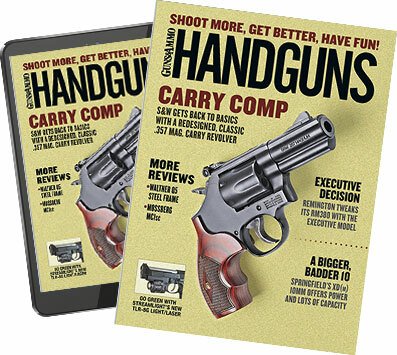 The Black Hills FMJ was the hottest ammunition I put through it, and after shooting a whole 50-round box through the pistol as fast as I could load magazines and pull the trigger, my fingers were only a little bit sore, which is pretty unusual when it comes to pocket guns. I.O. strongly cautions against the use of steel-cased ammunition in the Hellcat. It specifically recommends Magtech and Fiocchi ammunition—and of course I had neither on hand when it came time to test the pistols. The nickeled Hellcat ran like a champ with everything I fed it, but the blued pistol would occasionally experience feeding problems with the third round in the magazine (round stopping partway up the feed ramp), even with FMJ ammo. This was obviously a problem with the magazine rather than the gun. If I had a choice I'd take a second magazine instead of the small padded case provided with the pistol, but for a suggested retail of $240 the Hellcat is a value that's tough to beat.